My recent post drawing attention to Mohammad Alaa Al Jaleel's selfless work with both children and cats in besieged Aleppo has reached a very wide audience. 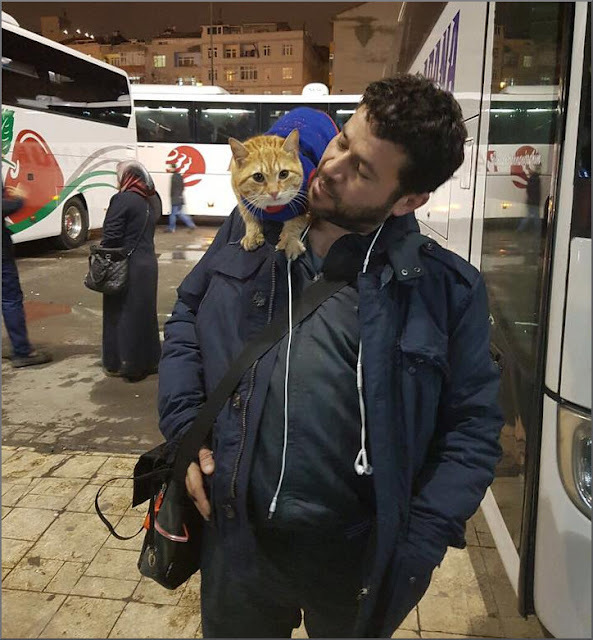 Now this photo of Alaa travelling with his cat Feras to continue his humanitarian work following their evacuation from Aleppo has appeared on social media. Those readers familiar with the 'A Street Cat Named Bob' books and film will be struck by the uncanny similarity. A BBC News video about Alaa's cat sanctuary in Aleppo before it was destroyed by bombing is below. About 60 of 170 cats in the Aleppo sanctuary were rescued and relocated with families that left the city. But many of the others were were feral and could not be caught and several were killed in a chlorine gas attack that came after the barrel bomb that killed the shelter's dog, It is hoped Alaa's humanitarian work will continue; but because of the very serious security risks in the region donations and further updates are being handled via the closed Facebook group, Il Gattaro d'Aleppo. Thank you again for your continued interest in this story, Bob. Anyone is welcome to request joining the Facebook group. Alaa is committed to rebuilding a dream he has of a "cat garden" that also has a medical clinic and a place for orphans, and using pet and animal therapy to heal the wounds of the Syrian conflict. He is a saint for cats and children. May he be many times blessed! and may he see his home again, at peace, safe for cats and people, in a better time. May it come soon, somehow.